3FM (Flexible Fiber Filter Module) is the next generation, ultra-compact filtration system that can be substituted for conventional solid-liquid separation methods such as coagulation, settling, and standard filtration. 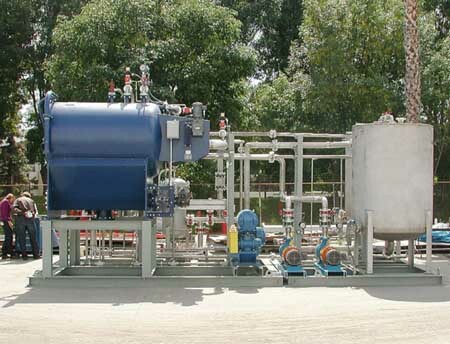 This system is ideal for suspended solids removal in industrial and agricultural effluent, tertiary treatment of wastewater, cooling tower recycle, and process water for reuse. Suspended solids are filtered at a high speed, radial flow by the robust flexible fibers composed of polyamide. These fibers are arranged in porous bundles and are packed vertically along the height of the filtration vessel. Particles are captured efficiently by utilizing all of the filter area through deep bed filtration due to the influent flow being introduced to the annular area of the system. This allows high flux rates of up to 10 times that of conventional filtration. The filtration capacity is restored by a filter backwash cycle utilizing air scouring followed by flushing and rinsing with treated water. The use of pre-set parameters allows the system to be fully automatic during the filtration process and backwash sequences. Filter media replacement period = 3 years.